Patriotic Crafts just in time for 4th of July!!! These 21 Crafts for Kids features 50 pages of the best patriotic craft activities + Crafty Kid Creations eNewsletter for FREE! Get this brand-new, FREE eBook collection filled with crafts that are sure to make your holiday the best one yet. In our latest eBook, AllFreeKidsCrafts has made sure that your holiday will consist of a little sun, a lot of crafting, and a ton of red, white, and blue. There are crafts that decorate your yard to turn your barbeque from fun to fantastic and others that will keep you busy right up until the fireworks show. Rockets’ Red Glare Bracelets (page 17) and lots more. One of my favorite Crafts from the Free ebook is Crash, Boom Bang Glitter. Watching fireworks is all my daughters' talk about once they realize the 4th of July is creeping near! 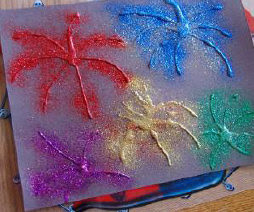 We've made these Glitter Fireworks a few times but I didn't take pictures, I'll make sure I take some next time. Below is the photo from the ebook! 1.) Use glue to draw firework shapes on a black sheet of construction paper. 2.) Sprinkle glitter on top of the glue. 3.) Turn the paper upside down to remove the excess glitter and let it dry completely. Find more Easy Patriotic Crafts by downloading the FREE ebook! Nothings better than Free Kids Crafts! Click link or banners above to receive your Free ebook! Are You Itching to Learn a New Craft?